Modulating Heat – Provides superior comfort over traditional single- stage and two-stage products, further reducing temperature swings in your home. Comfort Sync Thermostat – When you pair this model with the Comfort Sync thermostat, the system will continuously monitor internal components for optimum performance. When Comfort Sync detects that repairs and regular maintenance are needed, it alerts you or your dealer instantly via email. 97% AFUE Efficiency Rating – This means 97% of your fuel is converted into usable heat. 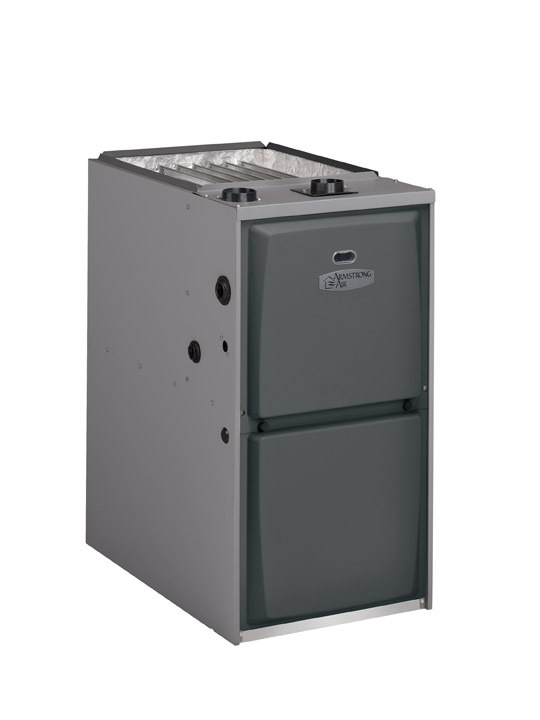 Compared to an older furnace, this can potentially save you hundreds of dollars per year in energy costs. ENERGY STAR® Most Efficient 2013 – ENERGY STAR Most Efficient is a new program to identify the most efficient products among those that qualify for the ENERGY STAR. Each product that receives this recognition demonstrates efficiency performance that is truly exceptional, inspirational, and leading edge. Quiet Combustion™ Technology – Uses a smaller Btu input per burner for quieter start-up and operation while providing more even heat distribution. Advanced Heat Exchanger – Made from stainless steel for maximum strength and crimped, rather than welded, Armstrong Air heat exchangers are highly resistant to thermal fatigue and other stresses caused by repeated heating and cooling. During the testing process, they are subjected to temperatures that far exceed normal operating ranges, to ensure they will stand up to years of use. 95% AFUE Efficiency Rating – This means 95% of your fuel is converted into usable heat. Compared to an older furnace, this can potentially save you hundreds of dollars per year in energy costs.